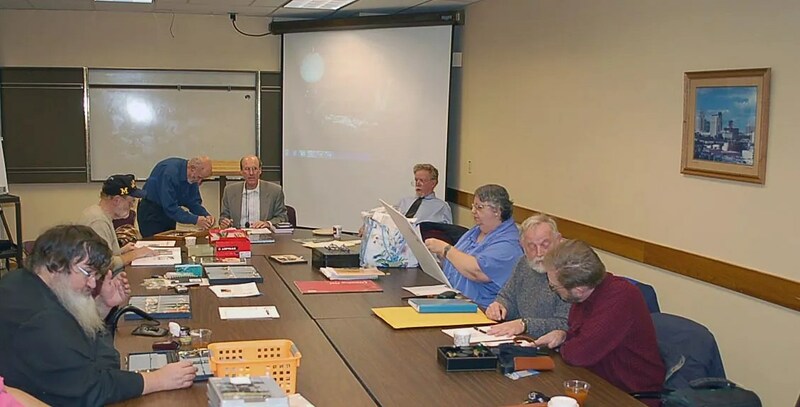 Below is a summary of the Friday November 15th Pen Club meeting. Formal election of officers for 2014 took place at the meeting . The present Board was reelected by acclamation. 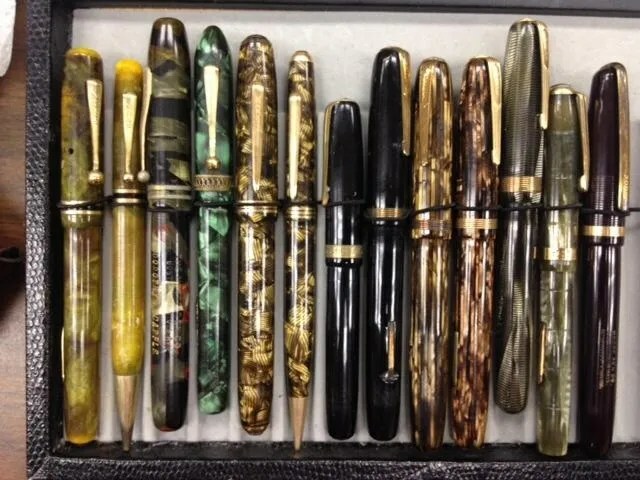 Francis reported on the Ohio Pen Show held in Columbus, Ohio. A very well run and friendly show run by Terry Mawhorter. There were over 150 tables with 75% carrying vintage pens. There were 2 separate auctions at this show; Friday and Saturday evening with about 100+ lots each evening. The theme of the evening’s meeting was “Calligraphy” by Nyleen Mullally. 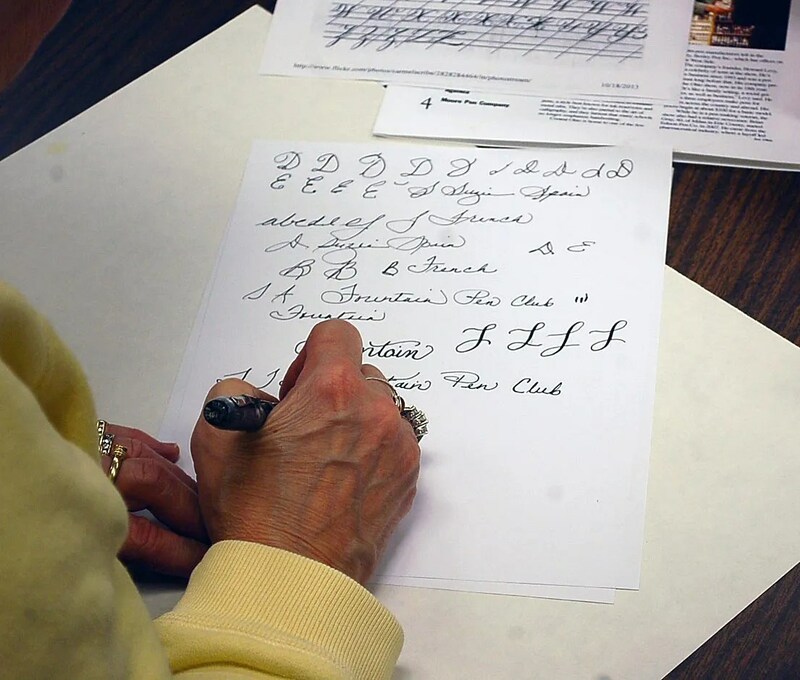 She discussed the history of calligraphy and had the attendees try their hand at Copperplate which is done with a flexible nib. I think everyone gained from the evening demonstration and penmanship test. 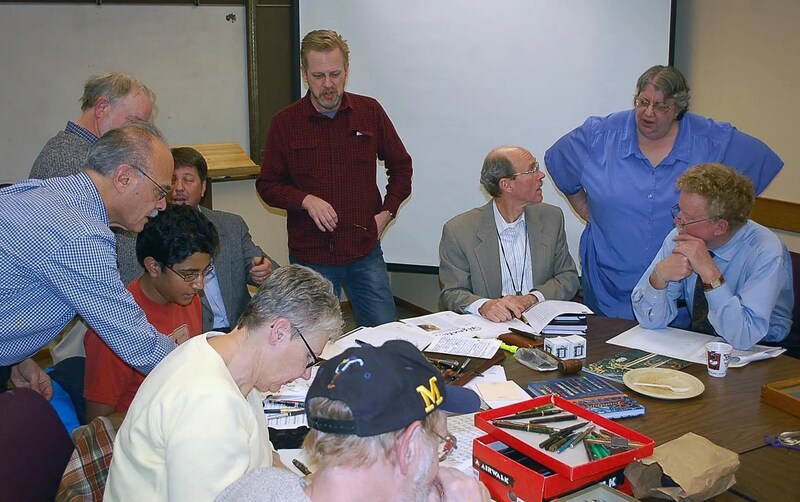 Below are photos of Nyleen’s outstanding presentation and demonstration, as well other members’ mastery of some of these fountain pen/ dip pen techniques. Don’t Forget ! Our December meeting will be the annual Christmas Party, December 29th, Sunday 4 PM to 9 PM. 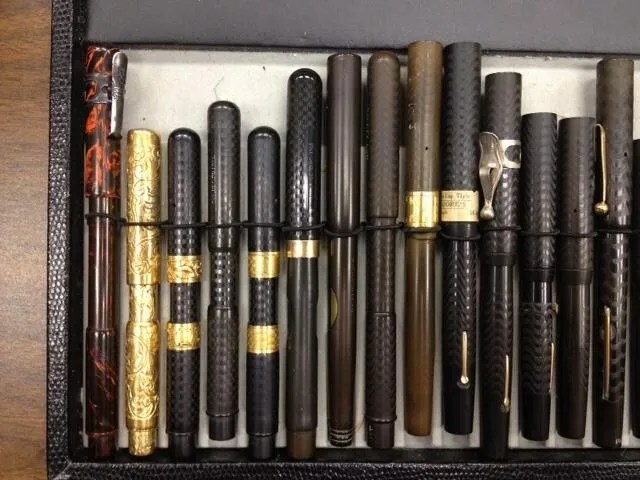 The October Meeting’s theme was Moore Pens. 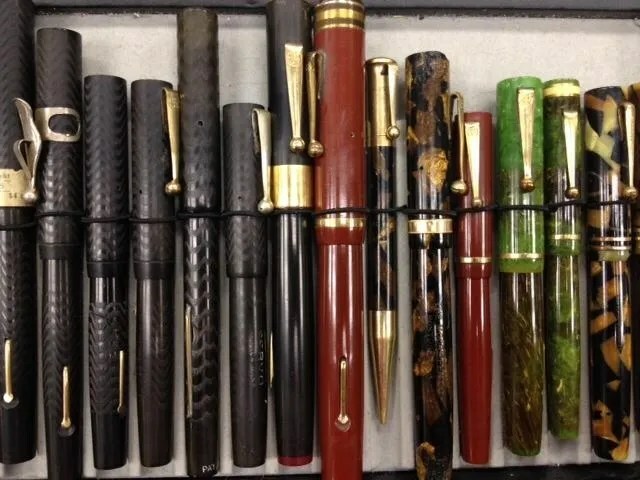 The membership shared examples of their pens and here are a few photographs of a large Moore collection. Don’t forget that the November meeting is on the 15th! 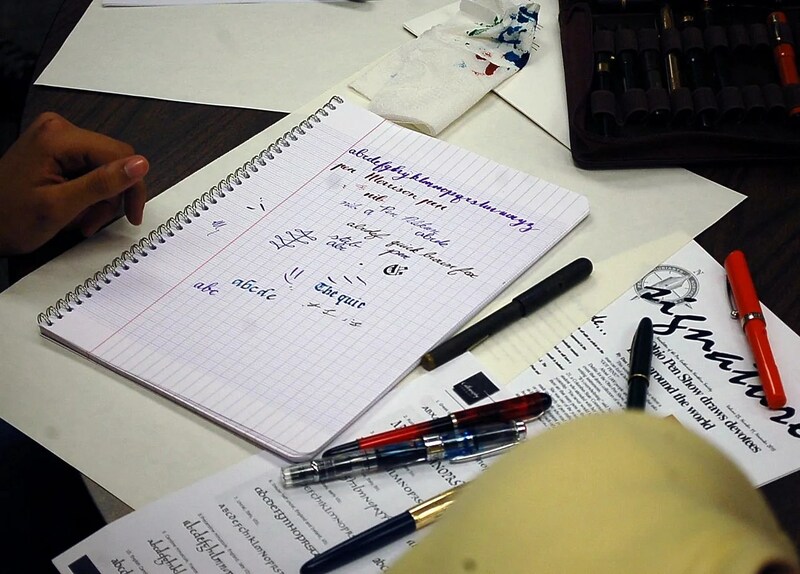 Election of Officers for the 2014 year will occur, and the theme for the meeting is Calligraphy by Nyleen Mullally! She will demo standard calligraphy. 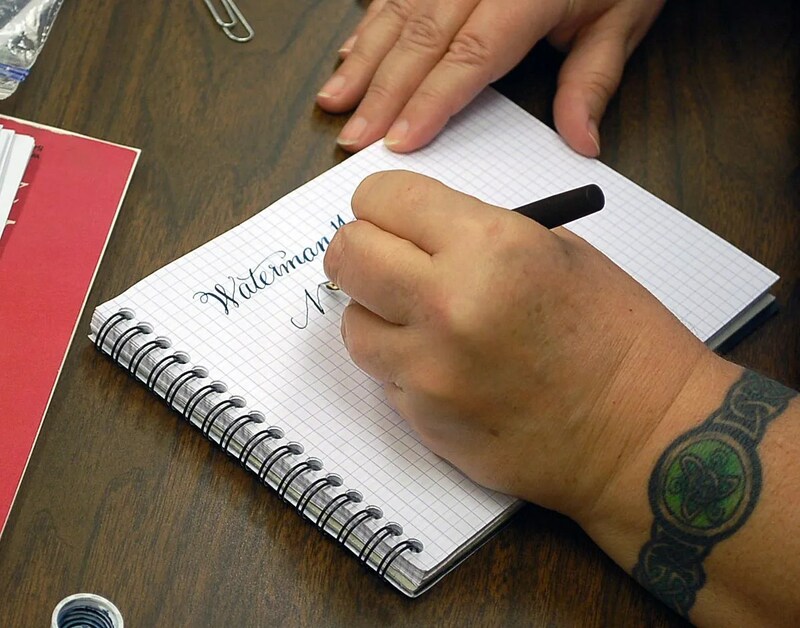 Bring a flexible nibbed pen and your favorite ink to practice “Copperplate” style of writing. You could also bring a dip pen with a flexible nib.